WP Ultimate Recipe is probably the best WordPress plugin for creating recipes. It has one major drawback – it’s not possible to link to WooCommerce products on your site. This seems like a feature that online food retailers would want. 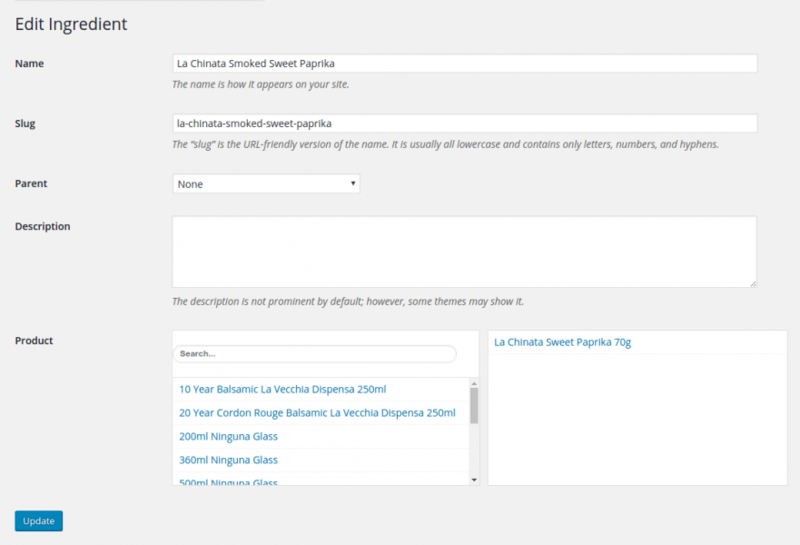 The WP Ultimate Recipe premium plugin adds the ability to add a link to a product ingredient. This is great if the store doesn’t have many products, or you want to link off-site. What I wanted was to let the site admin search their WooCommerce products without having to jump to a different tab to find the link. First, install WooCommerce, WP Ultimate Recipe (WordPress download) and Advanced Custom Fields (ACF). In ACF, create a new field group, “Ingredients”. Add a field called “Product”. Set the field type to “Relationship”. Set post type to “Product”. Leave the other settings at their default values. Under Location, set the rule to show the field group if “Taxonomy type” is equal to “Ingredients”. Create a recipe in WP Ultimate Recipe. The ingredients added here will be shown in wp-admin under Recipes > Ingredients. Click an ingredient to edit it. You should now see the “Product” field, with a nice and easy autocomplete input field. This is great if the site has hundreds of products. This section is based on the instructions for coding your own template from the WP Ultimate Recipe site. Then in your theme directory, create the directory includes with a file content-recipe.php inside it. This is just the basics for this tutorial. You will need to add the recipe method and cooking times. I created str_to_fraction() in this post Pretty print fractions as HTML entities using PHP. This is what we use to get the linked product from Advanced Custom Fields. I couldn’t work out how to get the value from ACF. So I looked at the database and realised the object is stored as an option. Save the file, and view the recipe on your site. You should now see the ingredients with links to the WooCommerce products. And that’s it! I really hope WP Ultimate Recipe adds this feature soon. But until then, we can use this. Hi there, I’ve followed this tutorial through a few times but dont seem to be able to get it to work. When I view a recipe, the page is just blank? I agree with Worlock, if you could add the ingredients to the shopping cart it would be quite amazing!